Friday Jan 27: 5:30. Bonfire, weenie roast on the levee at Butte La Rose. 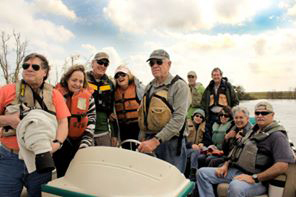 Meet and greet group members including basin crawfishermen. Sunday March 4: 1:00. Driving tour of Rockefeller and Lacassine wildlife refuges. See migrating waterfowl and all types of birds. Sat Mar 19: 12:00. Party barge Eagle tour near Morgan City. Last year we spotted 47 eagles and got some good pics. Note: space on the party barge is extremely limited. Those who want to be sure to participate, should bring their own boats are welcome to do so.